Posted May 3, 2015 by SJ Eye & filed under SJ Eye News. 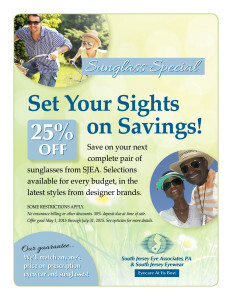 Save on your next complete pair of sunglasses from SJEA. Selections available for every budget, in the latest styles from designer brands. We will match anyone’s price on prescription eyewear and sunglasses. Some restrictions apply. No insurance billing or other discounts. 50% deposit due at time of sale. See optician for more details. Posted April 30, 2015 by Eye Care & filed under Millville eye doctors. Eye physicians in Millville at South Jersey Eye Associates are comprehensive eye care center experts. If you need preventive eye care, eye treatment or eye examinations, you will not require the services of any other Millville eye physicians. Not many eye physicians in Millville work at a comprehensive eye care center that operates as effectively as South Jersey Eye Associates. If you require eye treatment, preventive eye care and eye examinations, you will only need our Millville eye physicians. If you need eye physicians in Millville or could possible want eye treatment, eye examinations or preventive eye care, call the professional eye care center at South Jersey Eye Associates. We top the list of Millville eye physicians. Posted April 14, 2015 by Eye Care & filed under Cumberland County eye doctors, SJ Eye News. Cumberland County eye doctors at South Jersey Eye Associates are comprehensive eye care center experts. If you need eye treatment, preventive eye care and eye examinations, we are the sole eye doctors in Cumberland County you require. Few competing Cumberland County eye doctors say they run a comprehensive eye care center that can rival our operation. South Jersey Eye Associates provides preventive eye care, eye treatment and eye examinations. Not many other eye doctors in Cumberland County do as well a job at this as we do. If you want a comprehensive eye care center working on your eyes, and want this service provided by Cumberland County eye doctors, simply contact South Jersey Eye Associates. Few eye doctors in Cumberland County will offer our level of compassionate eye treatment, preventive eye care and eye examinations. Posted March 18, 2015 by Eye Care & filed under Bridgeton Eye Doctors, SJ Eye News. The Bridgeton eye doctors at South Jersey Eye Associates are well versed in all aspects of operating a comprehensive eye care center. When you require preventive eye care, eye treatment or eye examinations, there is no need for you to see any other eye doctors in Bridgeton. There is a dearth of Bridgeton eye doctors who would even consider saying that they run as professional of a comprehensive eye care center as we do. It means a lot to us at South Jersey Eye Associates that customers will trust their precious sight to us for their eye treatment, eye examinations or preventive eye care. No other eye doctors in Bridgeton will care for your eyes any better than we will. If you need a comprehensive eye care center, contact the Bridgeton eye doctors at South Jersey Eye Associates for all your preventive eye care or eye examinations. You even can receive eye treatment from our eye doctors in Bridgeton. Posted February 21, 2015 by Eye Care & filed under SJ Eye News, Vineland Eye Doctors. Vineland eye doctors at South Jersey Eye Associates are comprehensive eye care center experts. If you need eye examinations, eye treatment and preventive eye care, we are the eye doctors in Vineland for you. No other Vineland eye doctors can claim to operate a comprehensive eye care center as efficient as ours. South Jersey Eye Associates is proud to offer its clients a wide selection of eye examinations, eye treatment and preventive eye care. We take our role as leading eye doctors in Vineland very seriously. When you require compassionate care from Vineland eye doctors or the services of a comprehensive eye care center, one call to South Jersey Eye Associates is all it takes. Look to no other eye doctors in Vineland for your eye examinations, eye treatment and preventive eye care. Posted December 1, 2014 by SJ Eye & filed under SJ Eye News. Much more than just a fashion statement, quality sunglasses offer your eyes essential YEAR-ROUND PROTECTION from harmful UV radiation. 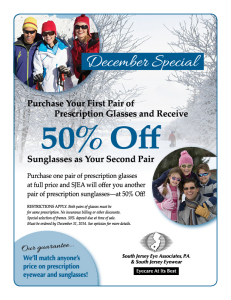 This December, purchase one pair of prescription glasses at full price and SJEA will offer you another pair of prescription sunglasses—at 50% Off! Posted September 30, 2014 by SJ Eye & filed under SJ Eye News. Bridgeton, NJ (SEPTEMBER, 2014) – This fall South Jersey Eye Associates (SJEA) is celebrating two major milestones. The first is the 17th anniversary of optometric physicians Dr. Robert M. Cole and Dr. Michael A. Feinstein merging their two practices into a family eyecare facility that would become a fixture of the community. The second significant event being marked is the one year anniversary of Dr. Brandon J. Wuzzardo joining the SJEA family as their third onsite optometric physician. SJEA has flourished since Dr. Cole and Dr. Feinstein joined forces in 1997, growing into one of South Jersey’s leading comprehensive eyecare and optical centers with a network of trusted consulting doctors and sub-specialists. As SJEA has grown, so has the community it serves. Dr. Cole and Dr. Feinstein brought Dr. Wuzzardo onboard last October, in part, so they could ensure the same standard of care for their existing clients while meeting the needs of new patients. Posted August 27, 2014 by SJ Eye & filed under SJ Eye News. Posted July 28, 2014 by SJ Eye & filed under Vision Library.